This past winter was rough here in Wisconsin. We here at SERVPRO got lots of calls for water damage caused by roof ice damming and flooding caused by snow melt and early rains. To put it in perspective, on an average day, our Appleton Franchise gets about 3 or 4 water calls. During the height of the “storm event” we were getting approximately 60 calls a day. There simply aren’t enough restoration businesses in the Fox Valley to service that many customers. As a result, we activated our National Storm Team and brought in crews from other parts of the country to help service as many customers as possible. We had two SERVPRO Crews from Virginia franchises working on our behalf in the Fox Valley. We are proud to be the only restoration company in the industry that has a national network of franchises that they can mobilize and bring in to a certain geographical area for a storm event. While that storm event is over, and the crews from Virginia have gone back home, we are expecting to receive a lot of mold calls this spring and summer from customers who had smaller amounts of water creep into their homes or businesses during that storm event that was previously undetected. In the coming weeks our blog posts will focus on mold, what it is, how it spreads, when it’s a problem and more. 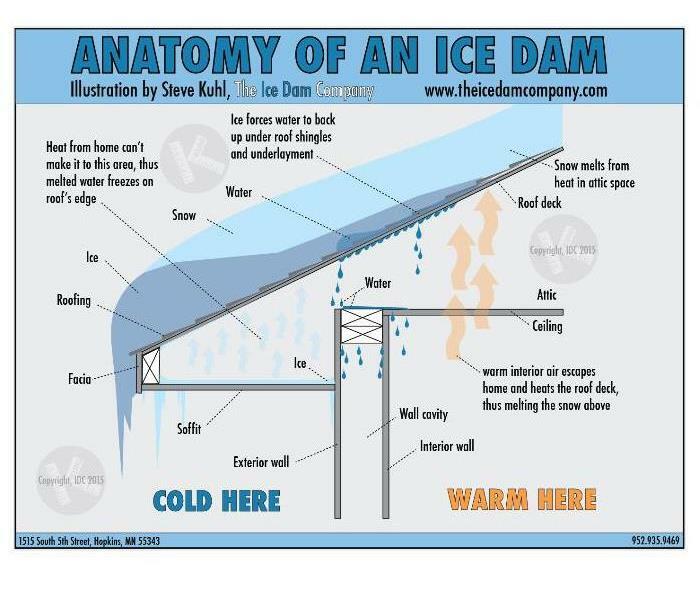 In our January 23rd blog we talked about the possibility of roof ice dams this winter. In the blog we explained what ice dams are, and some things you can do to avoid them. And sure enough, we received many calls this past month from homeowners that experienced water damage to their home because of ice damming. In all of these cases, water was leaking, and in some cases running, into the living areas of the home. But what if you had ice, ice dams, or icicles on your roof but didn’t see any water in living areas of your home? Is it safe to assume you didn’t experience any water damage? The answer is no. It is entirely possible that water leaked into your attic space but never made it to your living areas. And if that happened, you may have mold and eventually wood rot in your attic. If you had ice damming on your roof this past winter, a thorough inspection of your roof to check for shingle damage, and a thorough inspection of your attic to check for water intrusion, is a good idea. While the old saying “April showers bring May flowers” may be true; April showers (and even April snow storms!) can also bring water in your basement. But did you know that a standard homeowner’s insurance policy will not provide coverage for water damage caused by any of these four sources?! However, coverage for three of the four can be easily and inexpensively added on to a standard homeowner’s policy in the form of what’s called an endorsement. When this type of endorsement is active, it provides coverage of property damage caused by water that has managed to back up into your home from pipes, sewer systems, drains, sump pumps, water-service, or any additional system that transfers fluids to and from your home. Now is an excellent time to check with your homeowner’s insurance agent to ensure you have this very important coverage! And for more on sump pumps and how they work, see our blog post from February 1, 2018. 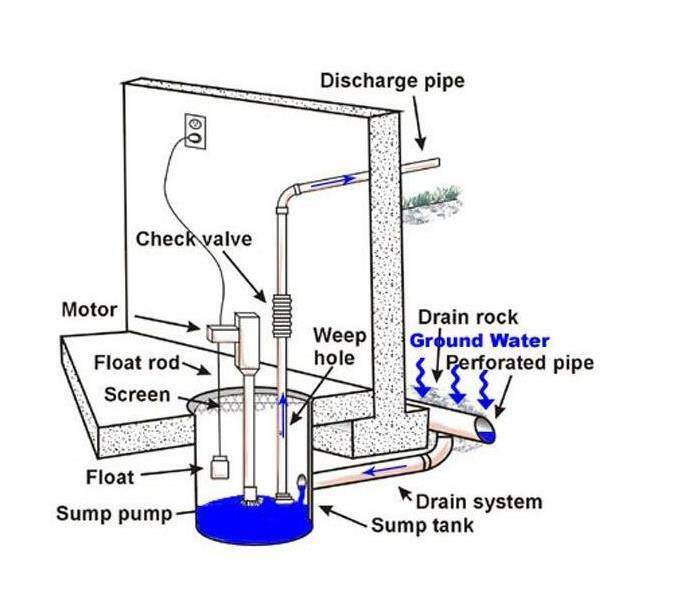 Yesterday we talked about sump pumps; how they work and why they’re important. Now imagine the potential damage to your home should your sump pump stop working for any reason; whether it be due to a power failure during a spring storm, or the simple mechanical failure of the pump itself. Without a functioning pump to pump the water out of your sump crock, and up out of your home, the crock will overflow into your basement, soaking your carpet and drywall if your basement is finished, and possibly destroying furniture, important documents and anything else you may have stored in your basement. And depending upon things like the water table and soil conditions in your area, the elevation of your home, and the amount of time the pump is out of order, the amount of water can be significant, causing havoc even in an unfinished basement. Many people may assume that their homeowner’s insurance will cover this type of damage. But did you know that in most cases, a standard homeowner’s insurance policy does not provide coverage for water damage caused by sump pump failure. However, this type of coverage can be very affordable and can easily be added on to your standard homeowner’s policy in the form of what’s called an endorsement. When this type of endorsement is active, it provides for coverage of property damage caused by water that has managed to back up and into your home from pipes, sewer systems, drains, sump pumps, water-service, or any additional system that transfers fluids to and from your home. Now is a perfect time of the year to check with your insurance agent to see if you have this important coverage, and if not, to add it before the heavy spring rains. In our January 18th blog post entitled “Landscape Grading & Keeping your Basement Dry”, we talked about surface water runoff and the importance of keeping it flowing away from your home in-order to keep your basement dry. But did you know that water below ground can also be a threat to your foundation? That’s where your sump pump comes in. In-order to understand how a sump pump works and why it’s important, it’s helpful to first understand the home building process. After a hole is dug by an excavator for a basement, the next step is to put in foundation footings. Foundation footings in Wisconsin are typically a poured cement slab, often reinforced with rebar. The footings are poured into the excavated trench essentially in an outline of the foundation walls. The footings provide a foundation upon which the cement bricks of the foundation will be laid, or upon which the cement walls of the foundation will be poured, depending on the type of basement wall construction used. The soil upon which these footings are poured needs to stay at a consistent moisture level to prevent settlement, heave, or differential movement. That’s where the sump pump and it’s supporting system comes into play. A drain system is installed around the perimeter of the foundation/footings. This drain system is essentially a system of pipes (surrounded by crushed stone) with holes in the top that collect water that is heading towards the foundation walls. The water that is collected in these pipes is redirected into a sump crock in the basement, where a pump then pumps the water up and out of the basement. Proper installation and maintenance of this entire system is essential to keeping a basement dry and stable. Injury, trauma, and even death, are a difficult but inevitable part of life. And, unfortunately sometimes these events take place in the home. Cleaning up can be emotionally challenging, not to mention dangerous if blood and/or other bodily fluids are involved. Did you know that our cleaning experts can handle any of these situations? We will treat your property and the people involved with the greatest empathy and respect in the face of trying circumstances and we will remove the burden of having to clean up. We will remove and dispose of bodily fluids, tissue and other potentially pathogenic substances. Then we will clean, disinfect and deodorize the structure. And if your home has become the scene of a crime, we can handle that too. Our experts can clean up things like: fingerprint powder, evidence-gathering chemicals, tear gas & pepper spray residues, and fire extinguisher residues. Soon it will be that time of year when flooding will be all over the news. Did you know that a standard homeowner’s insurance policy does not cover damage from flooding? Water coming into your home or business from the outside, through a basement window or other opening due to excessive rain or rising bodies of lake, rivers, streams, etcetera, typically falls under the category of a flood, and most homeowner’s insurance policies do not cover floods. According to a 2016 poll conducted by the insurance information institute, only 12 percent of homeowner’s have flood insurance. The second step is to determine if your home is in a flood plain. If it is, you are at risk of flooding from rising bodies of nearby lakes, rivers, streams, etcetera. FEMA (Federal Emergency Management Agency) can provide you with information you need regarding flooding. They provide copies of the latest and most up-to-date flood zone maps for most communities. You can start by going to: https://msc.fema.gov/portal Here you will be able to type in the address of your property, hit “search” and then click on “view web map”. If you have any questions, or suspect that your property may be in a flood plain, talk to your insurance agent. You may be able to buy a separate flood policy through the federal government’s National Flood Insurance Program (NFIP). Talk to your insurance agent about this very important coverage and what your risks are. Not all areas of a flood plain have the same risk. Having flood insurance, if it makes sense for your property, will allow you to get our experts in quickly to dry out your floors, walls, furniture and other belongings. When it comes to water damage, a fast response is important to keep costs down and prevent the growth of mold or other secondary damage. Our very own Marketing Manager, Joe Leadly had some fun last week at the Oshkosh Chamber of Commerce Business Expo.